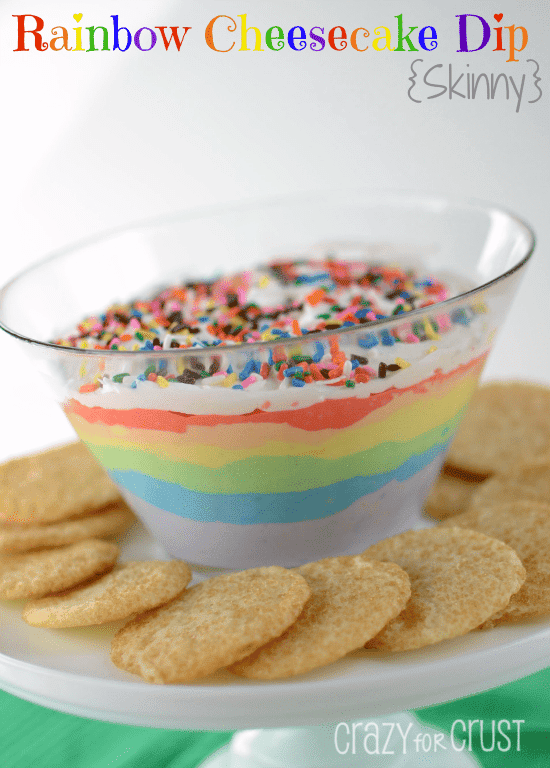 Rainbow Cheesecake Dip – this easy skinny cheesecake dip is tinted rainbow for St. Patrick’s Day. Serve it with gold coin cookie dippers! As a dessert blogger, I often get caught off-guard at the grocery store. I have a list and I’m on my way to the milk section when some new product catches my eye. It could be anything: a new flavor M&M, a new flavor Oreo or pudding mix. Even a new flavor coffee creamer or cake mix. It never fails – something NEW! and COOL! derails my whole shopping expedition. I spend the rest of the time wandering aimlessly creating the NEWEST! COOL! 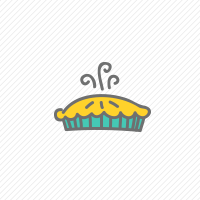 pie or brownie or magic bar. My local grocery store has begun selling bulk sprinkles and colored sugars. They even have naked sugar cookies, tarts, and piping bags full of icing. But the sprinkles call to me the second I enter the store. 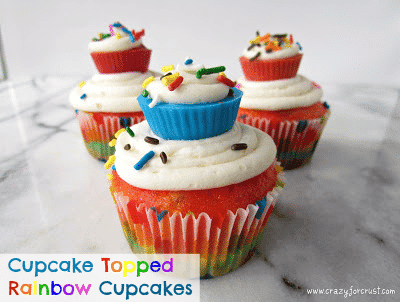 How can I resist a talking sprinkle? Last week I stopping in for a few vegetables and milk, and got waylaid by these talking bulk sprinkles in the bakery section. In particular, the gold sanding sugar caught my eye. I mean, St. Patrick’s Day and Rainbows scream gold. I stood in front of the cake case, holding a very large (and super cheap) container of gold sanding sugar, for quite awhile. In my head, I was running through all that I could do with it. It was like fast-forwarding a movie in my brain. Sr. Patrick’s Day is coming up quick. My favorite thing about St. Patrick’s Day is rainbows. 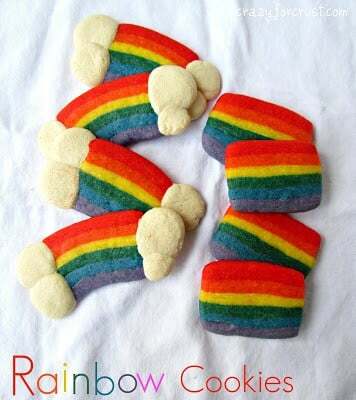 I love all things rainbow. I’ve made cupcakes and cookies. If I had my choice I’d do nothing but rainbow all month long. I was trying to come up with something new to make this year, and I know how much you all love dips. I mean, this dip is my most viewed recipe and probably will be for a looooong time. 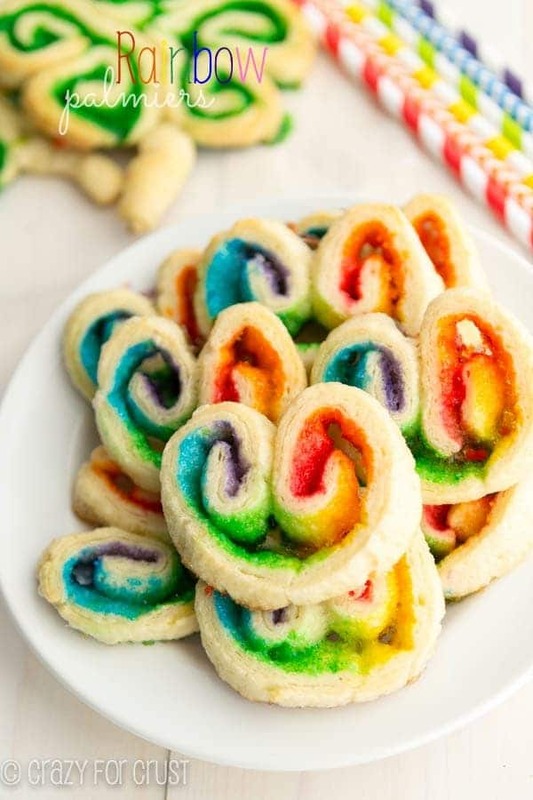 You also love skinny recipes, since this breakfast cookie is also in the top viewed. 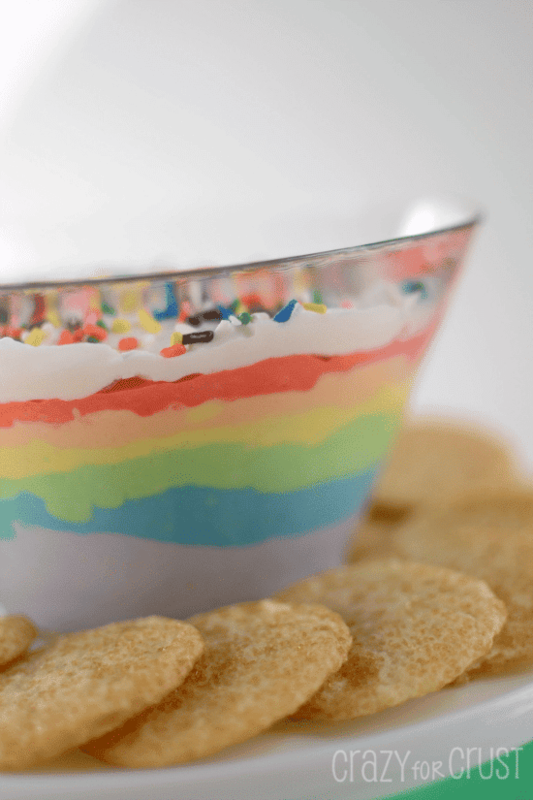 So, I combined skinny and dip and rainbow and I got something super pretty – and delish. Sweet dips are so easy to make. This one uses low-fat cream cheese, a box of cheesecake pudding mix (sugar-free, but regular is fine), and fat-free whipped topping. It’s totally skinny, but doesn’t taste that way! And what about that gold sanding sugar? I used it to make dippers: sugar cookie gold coins. I used a roll of sugar cookie dough (feel free to use your favorite recipe) and rolled it in the gold sugar before baking. I baked them a little longer than I would have if I was making plain cookies, so they are crunchy and hold up to dipping. The combination of the sweet cookie and sweet cheesecake flavored dip was amazing. Although I must admit: I ate most of this dip with a spoon. It was that good! And, it’s a rainbow. It’ll make you smile after the people at the grocery store think you’re crazy. 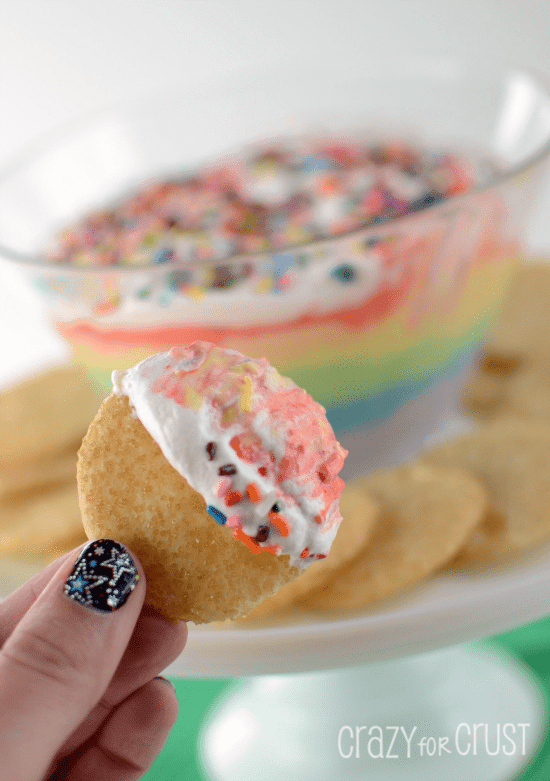 Rainbow Cheesecake Dip - this easy skinny cheesecake dip is tinted rainbow for St. Patrick's Day. 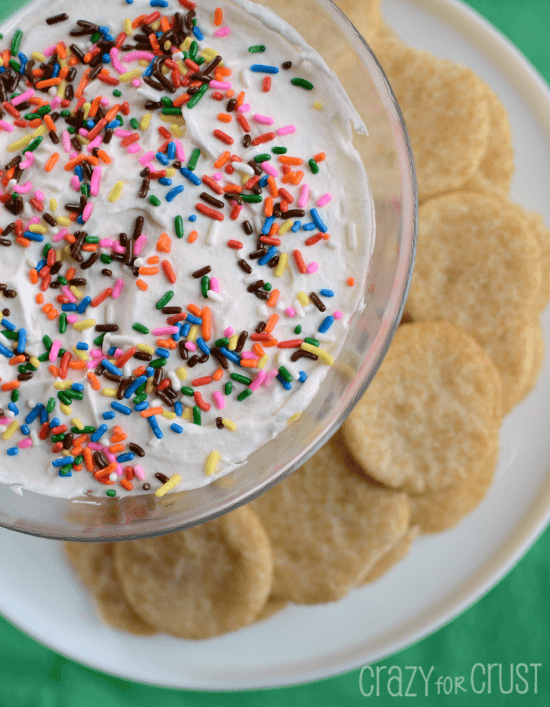 Serve it with gold coin cookie dippers! Beat cream cheese until fluffy. You can use a hand mixer (what I used) but a stand mixer is better because it helps get out all the lumps. Add pudding mix and milk. Beat for 2 minutes on medium. There will still be some lumps. Stir in extracts. Fold in whipped topping. 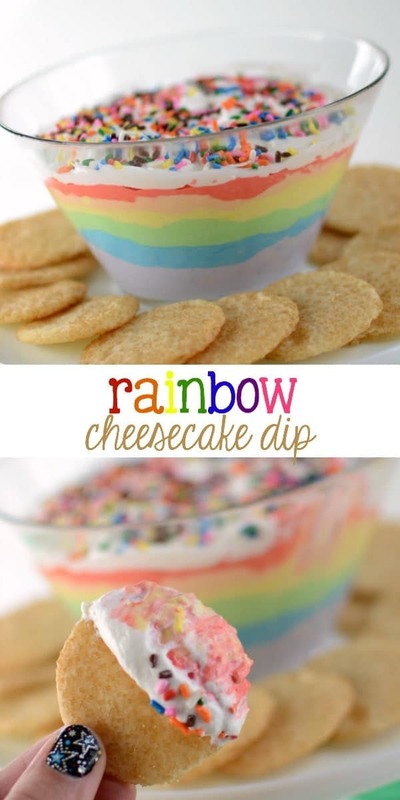 Using a clear serving dish, layer the colors of dip starting with purple on the bottom and working your way up the rainbow to red. When adding a new color, spoon it gently onto the top of the layers and spread gently with an offset spatula or the back of a spoon. Don’t push too hard or you’ll end up with tie-dye! Top with additional whipped topping and sprinkles. Cover and chill until ready to serve. To make the gold coin dippers: cut the log of cookie dough into 1/2” sections and quarter each section. Roll into balls and roll in sanding sugar. Place on a cookie sheet lined with parchment paper and bake at 350 degrees for about 9-11 minutes (they need to be on the crunchier side so they hold up when dipping). Cool completely and serve with dip!